Water Music Festival Promotion Tour will take place on Saturday, April 6, 2019 at Quantic in Bucharest, where you will have the chance to meet and listen to ZOB, Green Ties, the band and Petrescu Marcian & Storytellers. Between 12 and 18 August 2019, the 2nd edition of Water Music Festival will take place on the shores of Lake Izvorul Muntelui. The event will bring together lovers of good music, lovers of water sports and nature lovers. THE STAR WITHOUT A NAME, the first theatrical premiere of 2019 at Youth Theater, played in the evenings of 19th and 20th January, was highly appreciated by the audience seated on stage, nearby the actors. The show consists of a non-verbal performance after notorious Mihail Sebastian’s play, directed by Alexandru Mâzgăreanu. 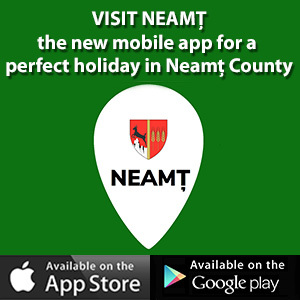 Neamţ County Council launched Visit Neamţ mobile app, a digital tour guide dedicated to promoting tourism on the territory of Neamţ County. The application is part of the promotional approaches of Neamţ County Council, simultaneously responding to the objective of increasing its visibility as a tourist destination, nationally and internationally and to the promotion of sustainable tourism in the region. The Christmas Fair in Neamţ will be ready to meet its audience on Friday, December 7th, at the Princely Court in Piatra Neamţ. In the opening of the event international artist Lou Bega will entertain all participants with well-known and beloved songs from his repertoire. Likewise in previous years, this edition of the fair is organized by Neamţ County Council, via “Carmen Saeculare” – Center for Culture and Arts in Neamţ.